Important: The files of the protein sequence and the nucleotide sequence have to be in fasta-format and must end with ".fasta". The protein sequence has to be followed by the nucleotide sequence. to control the alignment, the following parameters can be set. If not explicitly specified, the default will be used. = align prot.fasta and nucl.fasta with a gap open penalty of 12 and gap extend penalty of 2. framshifts are scored with -15 and -30. As scoring matrix the PAM250 matrix is used in the folder "matrices". Also a worst case calculation is used for the wild bases. 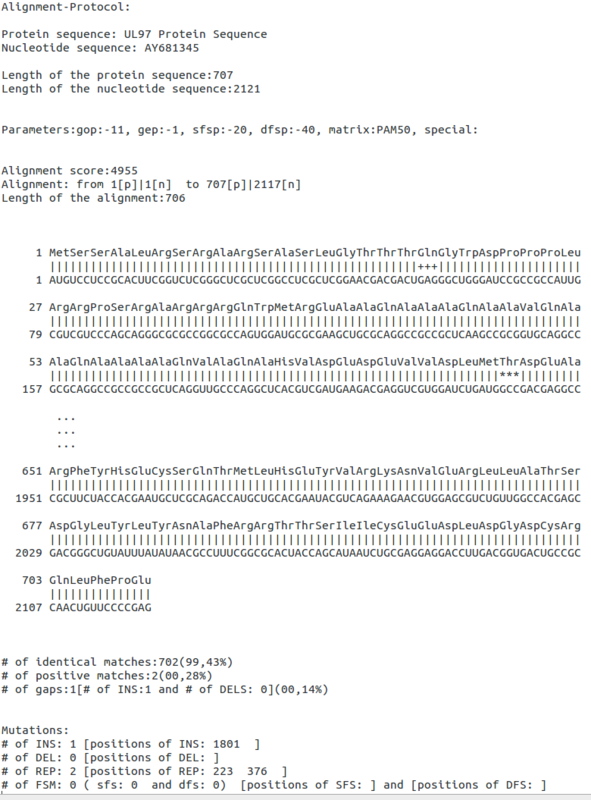 the commandline output contains the identifier of the aligned sequences, the length of the squences, a list of the used parameters, the alignment score (Smith-Waterman score), the start and the end positions of the local alignment and the length of the alignment. Also a detailed alignment is displayed. Finally informations about the amount of identical matches, positve matches, gaps, mutations and wild bases is displayed. Our paper "3D Network exploration and visualisation for lifespan data" has been published in BMC Bioinformatics. Our paper "Long-lived rodents reveal signatures of positive selection in genes associated with lifespan" has been published in Plos Genetics.